After a night of soulful music and dancing, elated from the cultural assimilation, we were back on the street the next day for more. 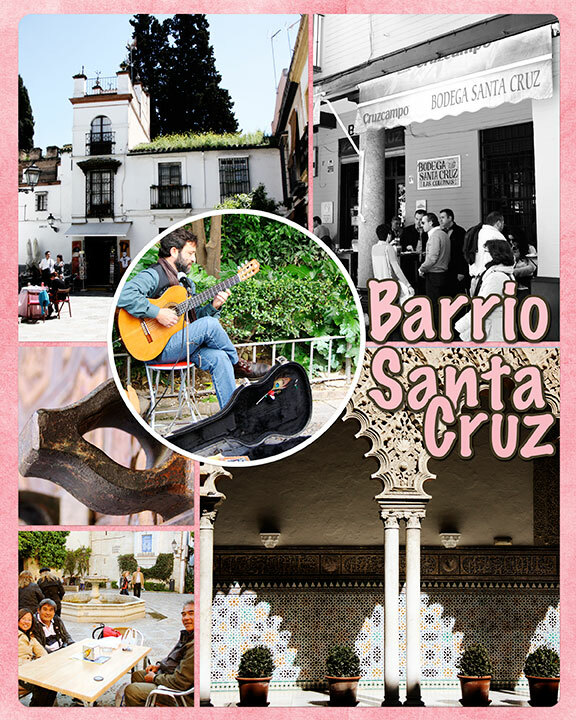 The Santa Cruz district, also known as Barrio Santa Cruz, the old Jewish quarters, is just a hop away from our hostel. 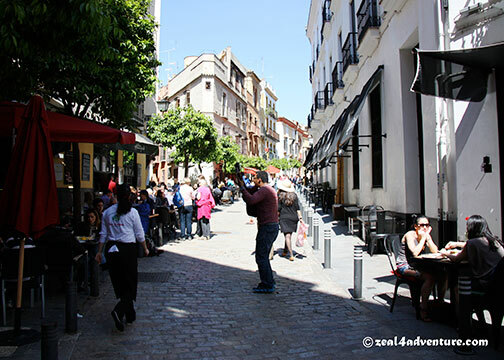 Sangre Espanola–burnt my MC here. 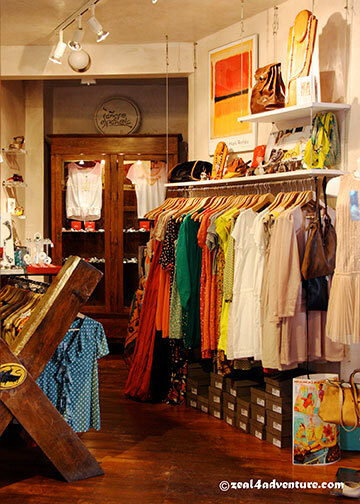 it is a natural gathering of visitors and the community alike. Picturesque lime-washed houses added to its charm. 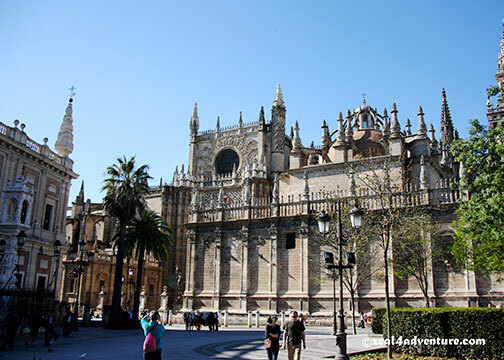 the Cathedral and its Giralda, the Archivo de Indias (which we failed to enter), and the Alcazar. 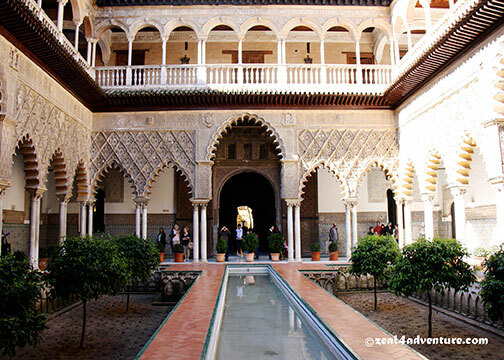 On the southeast side of the Plaza del Triunfo stands the Real Alcazar, supposedly the oldest European palace still in use. 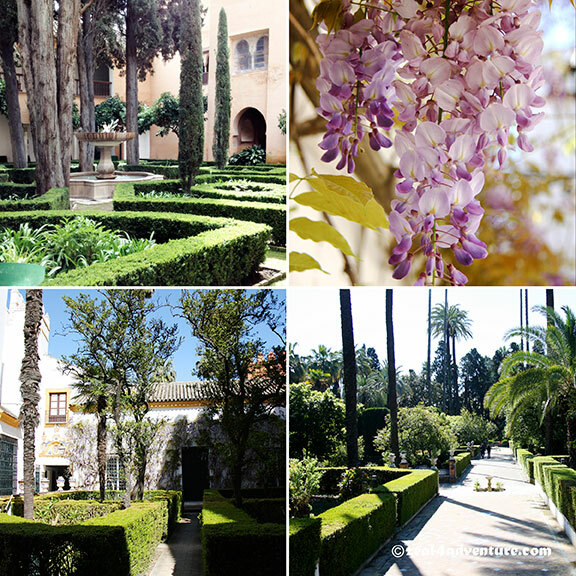 Walking through the Alcazar is like walking through the history of Seville. 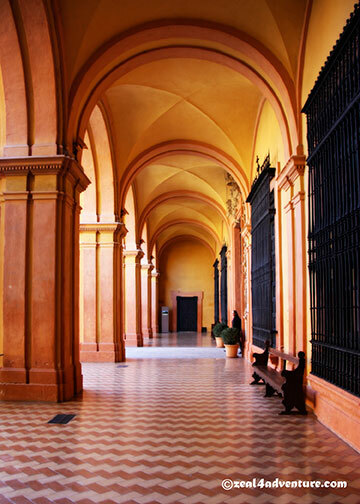 Art and architecture designs throughout the palace are marked by the diversity of cultures starting in Moorish times to the Middle Ages, the Renaissance, Baroque, and the XIX century. 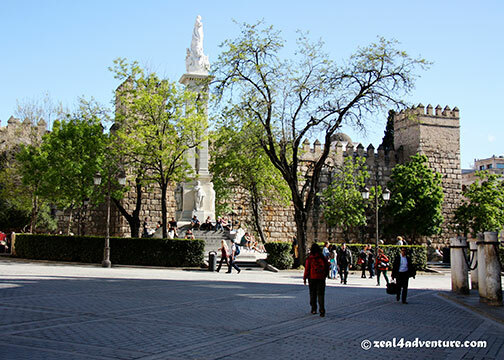 Before it became the royal palace of Christian Kings, it was once a Moorish fortress. 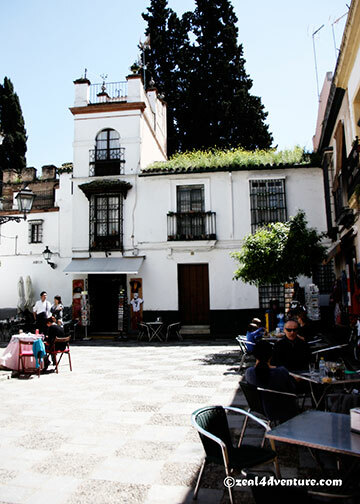 Today, it is still used as a part-time residence of the Spanish royal family, although only a few rooms are closed to the public. 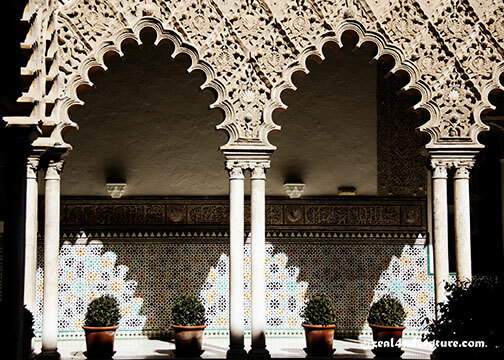 Built by Moorish architecture, the structure standing today still has details of a medieval fortress. 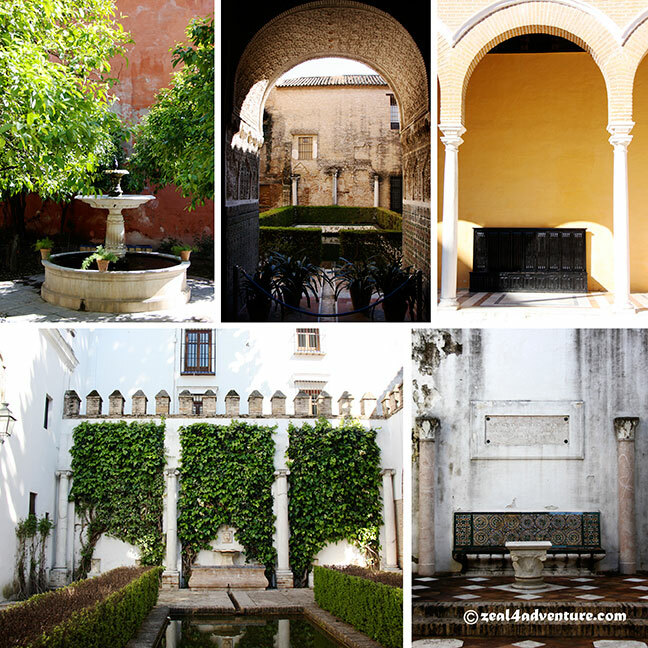 with its tranquil pond that reflects the Mudejar plasterwork will transport you to another time. 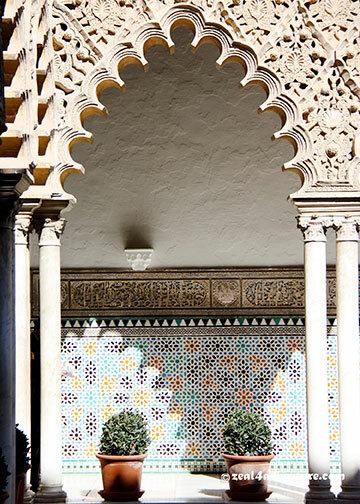 The intricate carvings and mosaic will leave you in awe. The castle is huge, which took up half of our day. 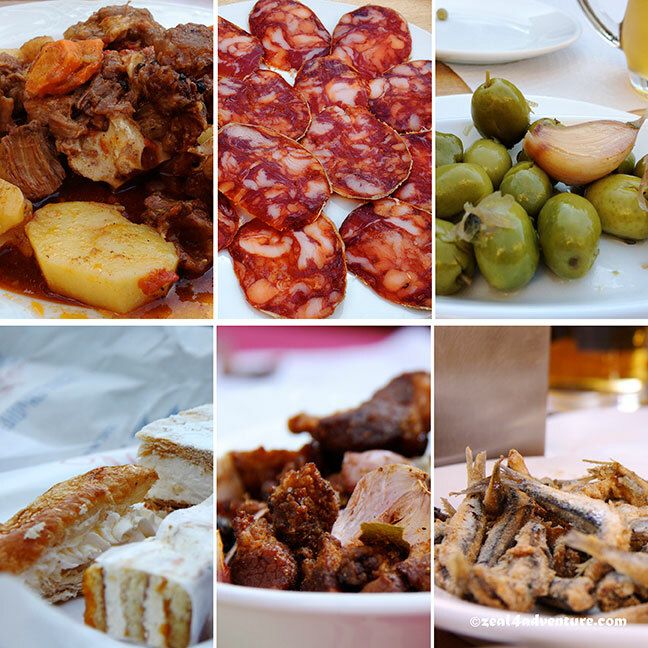 All the walking left us craving for tapas. 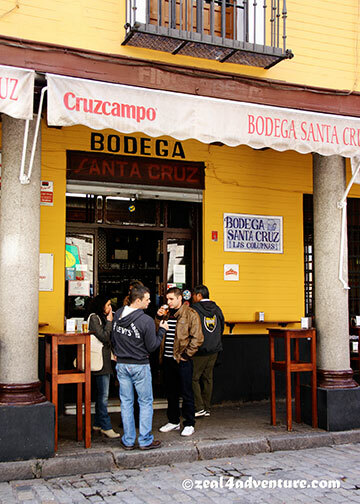 And my notes tell me that Bodega Santa Cruz is the place to be when in the area. The bar wasn’t swarming with people yet, as it was only half past 11, so we easily found a table at the corner, in plain view of our bartender who wrote our orders down in chalk. One by one, he calls out our orders, pringa, lomo chipiona, alitas de pollo, berenjenas con miel… all good that left us gratified. 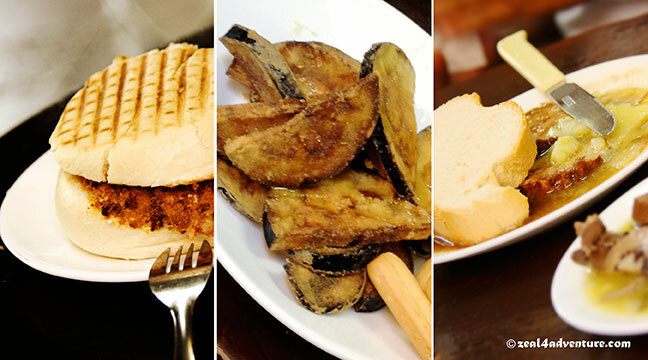 And after wandering through the barrio, we were back for more tapas, al fresco this time. 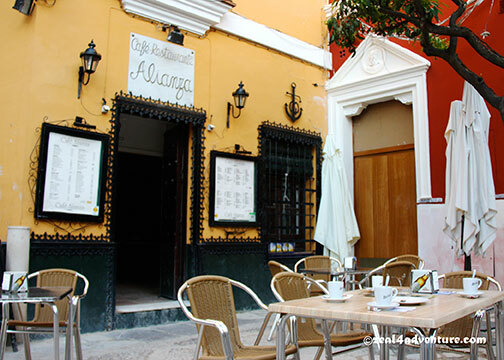 We settled for Café Alianza at the plaza of the same name. 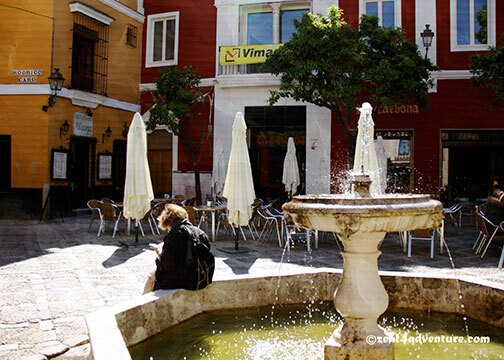 Satisfying early dinner in a lovely square, a great way to cap the day. 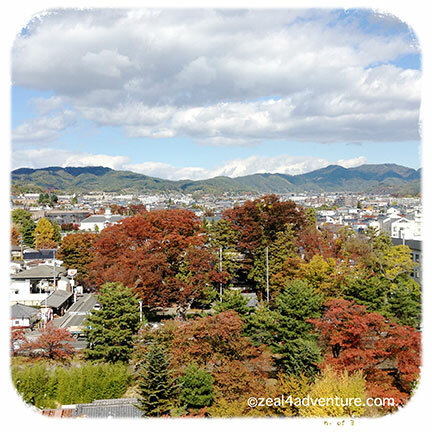 I peered from the balcony of our room, amused by the change of yesterday’s warm hues of autumn. 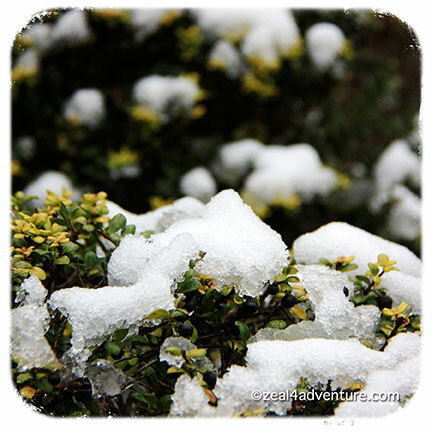 Today, I wake up to the white of winter. 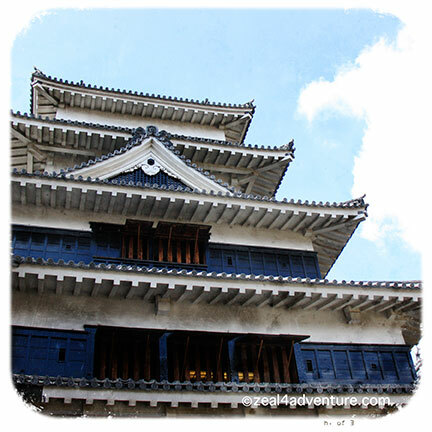 Our agenda for the day was to spend it in the castle town of Matsumoto. 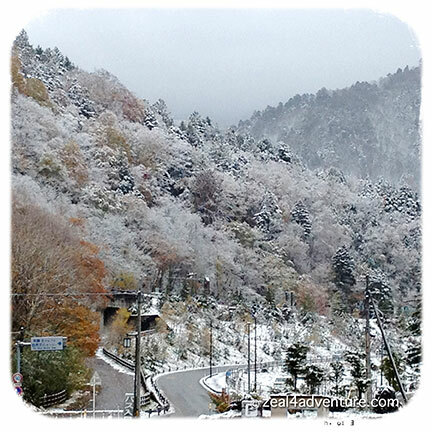 The scenery from the bus, now covered with snow, looked different from yesterday. Then we entered the tunnel and just like that, we were transported back to autumn – quite magical, really. For a moment, I thought I walked into the wardrobe like the characters of the high fantasy novel by C.S. Lewis, The Chronicles of Narnia. The wonders of this world continue to amaze me. 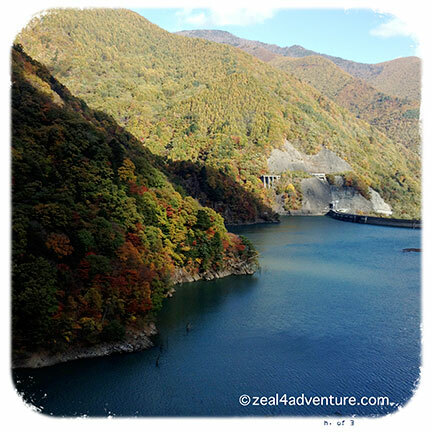 The ride from Hirayu to Matsumoto was a gorgeous one-hour journey. 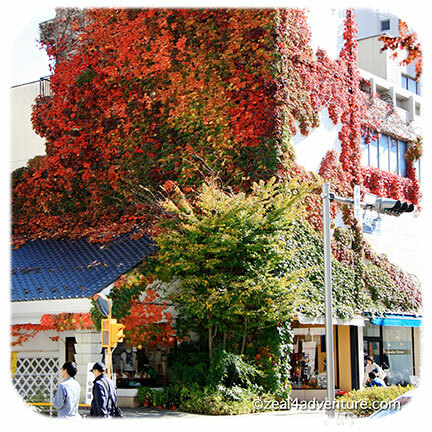 Compared to Takayama and Hirayu, Matsumoto’s bigger roads and taller buildings exude a much modern feel despite having one of Japan’s premier historic castles in its midst. 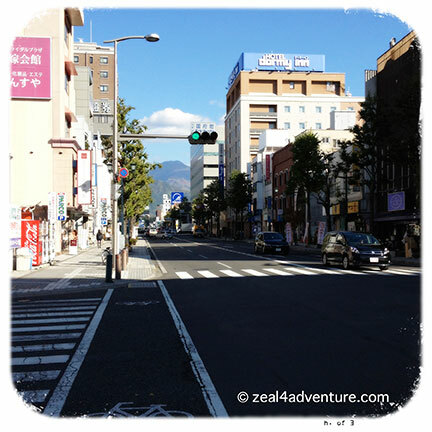 That and the Japanese Alps are the main pulls of the town. 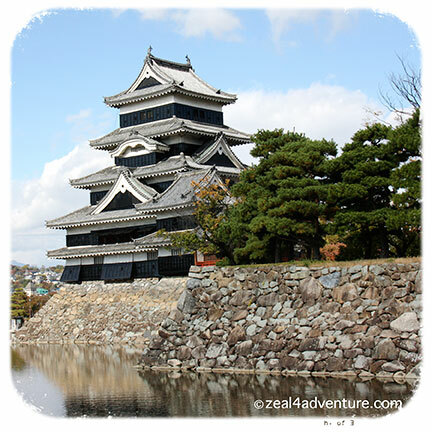 The Matsumoto-jo or Matsumoto Castle, as it is simply known, is one of the most complete and beautiful among Japan’s original castles. and its roof that resembles wings spread out, boldly standing out against the magnificent backdrop of the Japanese Alps. A view of the perimeter of the city from the 5th floor — the strategic office. The lofty 98-foot structure can be seen from almost anywhere in the central city which makes it easy to find. and the moat form an extensive system of defense given the lack of natural defenses the castle was built on. A fascinating design of the castle, which could have been a strategy to keep the floor safe from the enemies, is a floor hidden from the outside. The 3rd floor has no windows and sometimes called the “dark floor”. Another feature that could have “defense” in mind is the steep incline and the high rises of the stairs. This prevents from climbing fast. In fact, slippery wooden floorboards and socks (as we had to walk around carrying our shoes in a plastic bag) makes for a terrifying climb on those stairs. 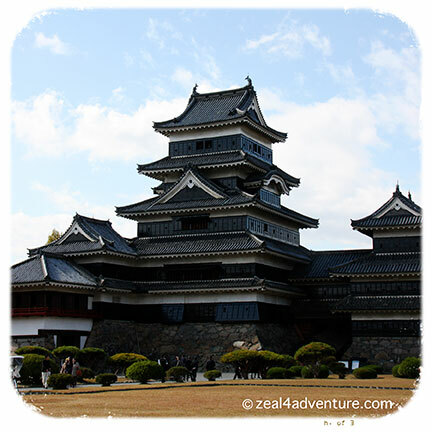 Listed as a National Treasure, this well-preserved castle is a good example of a hirajiro, and many of it is still as it was – the moat, the gate, the various bailey and the sub floors minus, however, the furniture and furnishings. 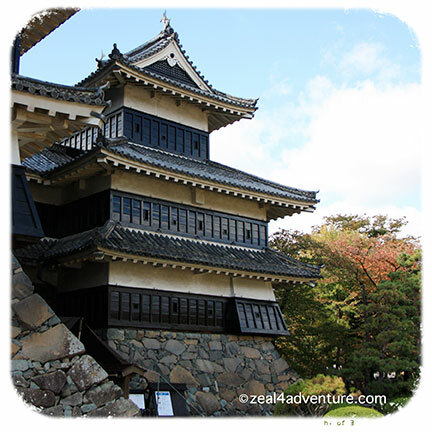 The tenchu or the keep though holds an armory and weapons museum. 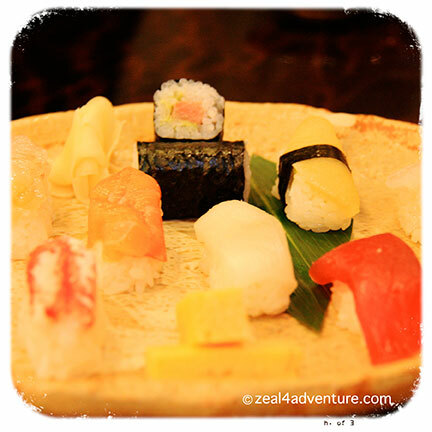 and sampling excellent sushi in between. 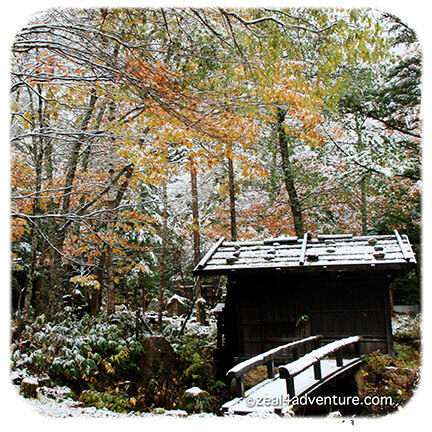 And through the same tunnel to Hirayu, we found ourselves back in winter.